The question of how 'safe' is it to soak in a hot springs in Idaho is a common one. The following techniques will help you discern if that backcountry hot springs you tracked down is relatively safe to qualify. 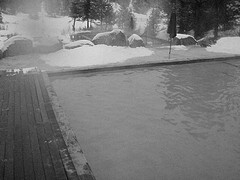 In regard to safety; I need to mention that I know many hot springers that will, and have soaked in just about anything. Many have soaked in stagnant water, filled to the brim with sludge and silt - horse fly larva laden, rotten egg smelling hot springs and have survived to tell about it. However, that's Idaho. There are hot springs in other states with reported cases of acanthamoeba (see below). That's not to say the brain-infecting amoeba doesn't exist in Idaho, it just might be there haven't been any reported cases. Acanthamoeba – an amoeba that is known to inhabit some hot springs which can enter the brain through nasal passages and cause meningitis. This is another reason to keep your head above water while soaking. Usually, hot springs with acanthamoeba are signed. One method of discerning a 'safe' soak is to simply test the quality of the water. This can be done with a pH strip test. The pH scale runs from 0 to 14, where lower numbers represent acidic mineral content and higher numbers represent alkaline mineral content. A pH of 7 is basically neutral. The more alkaline the better soak (alkaline-based minerals are typically good for the skin). Acidic-based hot springs are not ideal because the minerals can be harsh on the skin/body. In my experience, alkaline soaks have water that feels softer - like it slides over your skin, feels like the water is more dense than normal. The more acidic-based, the more it dries out the skin. I could be wrong on this, but it seems to be a reoccurring theme. Gold Fork near Donnelly has the highest recorded pH in Idaho at nearly 10, and as such has an abundance of lithium in the water. The last time I was there I actually saw a bunch of people scooping up the water in cups and slugging it down! Not advisable! You can pick up pH test strips at restaurant supply stores for a good deal, just make sure they are the type used for dishwashers. If you plan on pH testing hot springs, it's important to remember that pH is directly tied to temperature. In order to maintain accurate data both need to be recorded at the same time. The amount of hot water emanating from a hot spring and/or into a hot springs fed pool is another KPI to consider when weighing-in on soak safety. Very little flow and resulting stagnant water could become a haven for pesky insectoids and poor water quality. Abundant amounts of silt are often present within the confines of the pool walls when low flow and/or stagnant water issues are afoot. To somewhat circumvent the associated risks of soaking in a stagnant water pool hot springers have been known to bring their own pool. This is done by placing a tarp into the existing pool; on-top of the silt and gook, allowing for only clean water to enter the newly formed pool. Tarps are not left behind either. Remember the hot springer's motto - pack it in, pack it out. Pro Tip! Time how long it takes to fill up a quart container with hot water that is used to fill the pool (if accessible/possible) you plan to soak in. Divide by 15 to get the Gallons Per Minute flow rate. Some hot springs pools are fed by water at the exact spot where it erupts from the earth, while other pools are fed by water after prior exposure to atmospheric and environmental elements - more specifically - wildlife, before entering the pool. This is typically due to landscape-based conditions, or more commonly, the need for the water to 'air cool' prior to entering a pool formation for the purpose of achieving optimal soaking conditions. It is always a good idea to scout around before soaking in a hot pot for the first time. Look for things like downed carcasses or animal feces in or around the pool source. Watch out for nasties left behind by pesky Jackholes as well (AKA trash mongers/jerks/just plain gross humans). Don't forget to check the bottom of the pool(s) for broken glass and other treasures. 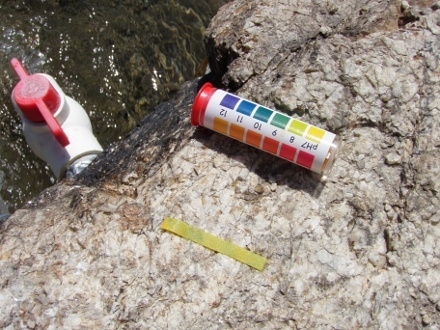 To recap; pH strip testing, pool size/flow rate and the utilization of general bug/wildlife information can be used to help assess soak-safety concerns when visiting new hot springs in Idaho's boundless backcountry. No Soap, Shampoo or BIO-Soap/Shampoo Allowed in Hot Springs! Avoid Being Fined! Public hot springs are not bathing facilities and do not have 'plumbing' like that of commercial, improved hot springs. Soap and shampoo (including biodegradable soap and shampoo) do not completely breakdown naturally. This pollutes our water systems (ingested by fish, animals, humans) at or near the source. This is also illegal in most wilderness and public lands areas.